A small plane crashed in the Yucatan wednesday. This was the flight that I was on on 8/19 (3 weeks ago) when I visited the Mayan Ruins, and may have been the same pilot and plane. 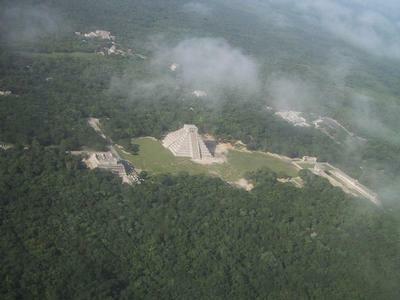 I shot this picture on the approach to the airport in Chichen Itza. I have never been just small steps away from so much death and destruction. One family member was supposed to get on a train from Boston to NY Tuesday afternoon. A cousin in the financial district, but not the WTC, and is safe. Family around DC was one major traffic jam away from harm. We live our lives with the implicit assumption that the future will look something like the past. Things don’t just blow up and dissappear without a trace.